BumbleBeads Designs: Bead Soup Blog Party: The reveal! Bead Soup Blog Party: The reveal! 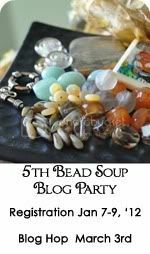 It's Bead Soup Blog Party time!!!!!!!! 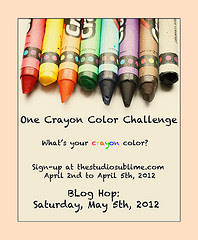 This is the longest post I've ever written but it's also the most exciting. 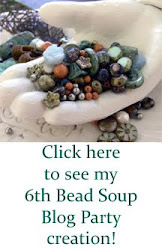 Last month, I got to participate in my first ever Bead Soup Blog Party. What happens is each participant gets paired with a partner and they exchange a 'soup' of beads. The partners are meant to challenge each other by getting her to work outside her comfort level. This was definitely a challenge for me as I've never worked with copper or brass before. When I first got my package from Shanti Johnson, I immediately loved the colors. It was so bright and orange-y and pretty. My next thought was "What am I going to do with these????????" It took a while but I started working with the brass 'hope' focal first. This is what I made with the brass materials but it was too simple and I didn't like it, so I took it apart. Copper leaf toggle clasp. So pretty! Other than the two butterfly stone beads, I used some turquoise stones, brown wooden beads that went will with some orange rondelles. I love the leaf toggle, so I used that in this piece. As I looked at the rest of the beads, I really couldn't figure out what to do. I've never used copper before. My main material for my jewellery pieces were silver and pearls. As I finished that butterfly piece I actually ran out of copper materials. So I thought, "Why can't I mix colours together?" and that's how this necklace came about: A mixture of copper and silver. haha... I know, I cheated. 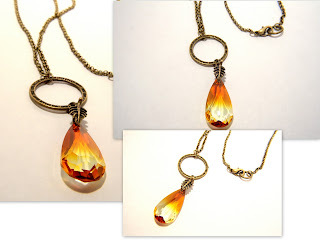 This necklace was made from a two-toned Swarovski crystal and one of the focal rings from Shanti. Isn't it beautiful? This necklace is now on sale in my Etsy store. Just click on the link below. This brass bracelet uses the really cute elephant clasp and some brass rings. I thought, I would just add a litte bit of me to at least one piece, so I decided to sprinkle it with some white, creamrose, and bronze Swarovski pearls. I started my beading hobby by making earrings and I can't believe through this whole bead soup, I only made one pair of earrings. These are the pretty turquoise stones with brass chains. Visit my Pinterest (will be updated once I get to all the posts) to see all the awesome creations or visit each persons blog below. Love what you have made!! Oh, my dear, Tracy - I love what you made. I am always very fond of simple designs, for me they catch the eye and they spell 'elegant' :) I fell in love with the double strand - I just love butterflies, and the colour combination is perfect (well, I am biased, since turquoise happens to be my #1 choice of colour / stone). The Swarovski necklace is such a versatile piece - can be used for pretty much any attire or occasion. Both bracelets and the earrings are gorgeous too. I like how the butterflies necklace, the first bracelet and the earrings mix and match into one set. Great work! Well Partner, u sure seem right at home with copper & all sorts of components! I luv all your designs! They turned out beautifully! Luv the earrings, bracelets the butterfly necklace and the Tweet piece! No favorites here or should I say their all my favorites!! they are all so pretty, my favourite is the butterfly necklace! I love the colour combos you made. Looks like what I sent my partner in Saskatchewan. Great work! 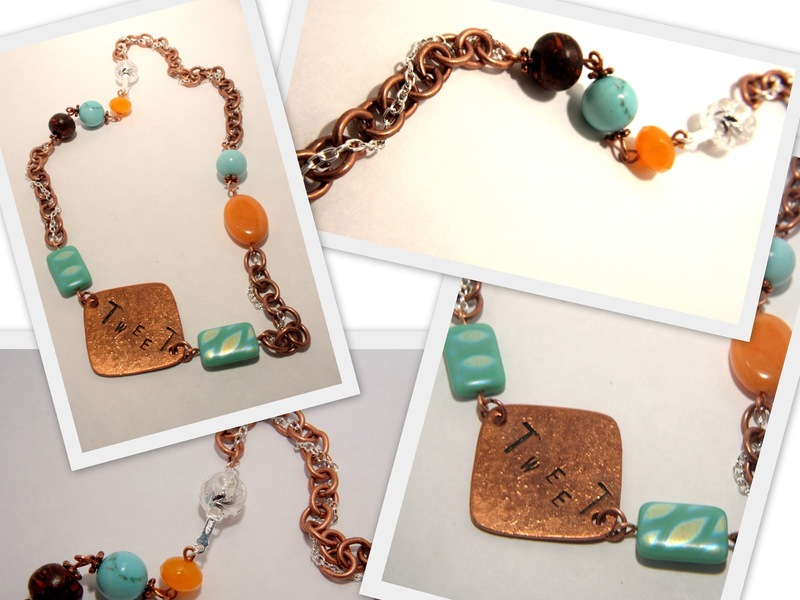 Ahh...butterflies, my signature, copper and orange...both of my favorites! What's not to love! I love all those juicy oranges -- and I love what you made! I certainly will!!!!!! This was so much fun!!! Thanks for organizing everything! Summery and gorgeous. I love the creativity in those pieces. I love the summery feel of the first two pieces, and the earrings. And the pearl bracelet is lovely. But that necklace with the Swarovski Crystal is stunning in its simplicity! It's my favorite piece! All your pieces are very pretty. Great job on them! Love your pieces! The butterfly necklace is spectacular! You received happy beads and made happy pieces! What more could we ask for?? :D Love the 2 toned Swaro!! So many beautiful pieces! Lovely work! Love what you made with those gorgeous colors! Wow! For working outside your comfort zone you did such beautiful things with copper! Do you think you'll be venturing out more often? Is there more copper in your future? :) I hope you had fun! I like how cheery and fun your pieces turned out. And lol at how you had to add a little 'you' in that bracelet. Wonderful work all around! So happy and cheerful colors! Beautiful! Well done, love the way you used the butterflies, that's a great necklace. What a fun, happy mix! I'm a sucker for butterflies, so that necklace is my fav :) Gorgeous work! I so adore your butterfly necklace! The balance is so great. I love that key focal necklace, too. Very simple and elegant. Great work! What a striking color palette! This will look great for summer! Congrats on such a great piece! What a busy beader you were! The colors in the first piece are so tropical. They made me smile. Nice job! I love the necklace with the butterflies. It is so pretty and colorful. Tropical even. Beautiful. Great job! I love the simple swarovski crystal necklace! I actually love them all! The turquoise looks great with the chain. Love the way you wove he butterfly in. Nice work! The simplicity of the swarovski crystal necklace speaks to me.Your earrings are very cool. I love pairing the leaf clasp with the butterflies and the elephant is way cool on that very pretty bracelet. Can you tell I love your creations! There is absolutely no way I could pick a favorite from all of your beautiful creations! However, the first, multi-strand necklace is awesome! And the turquoise stones on the brass chains are so cool! I would wear every single one of your pieces! You did a beautiful job! Wonderful! I love your butterfly necklace!! But then Orange.. Its a good thing! Love the multi-strand necklace and all of your creations! The soup you sent her was wonderful! Orange, tuquoise and copper is such a wonderful colour combination! Very pretty! Beautiful jewellery, all of it! I really like the different colour combos and designs. Fab job! Awesome! Love those colors you got to work with! And your final result doesn't look like those bright colors scared you at all!! Very pretty designs! Great pieces for working out of your comfort zone. You created a wonderful collection. My favorite piece is the third necklace, the colors are great and the design fun and contempoary-love it! Great designs. I really love the butterfly necklace, beautiful! I love your really simple designs. It is all so elegant. Great job! Great designs! Mixing metals isn't cheating, it's cool...and smart. I love that you decided to infuse some of your own style to the bracelet. These designs are all so nice. I especially like the first necklace! Well done. I love that necklace with the butterflies....it says happy!